Blood-Red Pencil: What Are You Afraid Of? The world's most famous horror writer would know a thing or two about fear, wouldn't he? 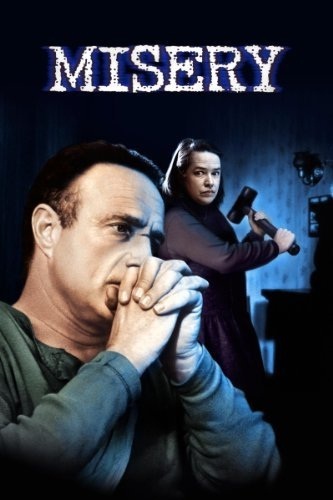 Misery was the first Stephen King book I read, and is a story that spoke to some of my major writing fears: the possibility of being "hobbled" by early and/or desperate choices of genre, style, publisher, and contract terms; and (more generally for anyone who risks any sort of fame) the nightmare of attaining a stalker. Many years ago, when I first, naively, paid for website hosting, I was (ahem) horrified the day I checked the Who Is information on my website and saw that my home address was displayed publicly for the world to see. I solved that problem by moving house. Elle Neal still occasionally hangs around her old neighbourhood to throw the Paparazzi off track. Who told you she lives in Australia? No, she doesn't. And her website is not HearWriteNow, so don't you dare visit it. And if you comment on this post she might just add you to a list of suspected stalkers. Okay, stop reading now, you're making her nervous. Really. I still always feel that crunch in my tummy every time I hand over a piece of writing for someone else to look at, whether it's an agent or a crit partner online. Just have to grit my teeth and do it, though. My doubts and disbelief in myself as a writer run deeper than my fears, but I have at least one great fear: that my decision to go the indie route will forever haunt me and doom me to eternal isolation in the indie ghetto. Deadlines ... dang near killed me in the real world ... now I avoid them like the plague. Getting too old to care about writing or anything else! And I share a certain degree of fear regarding online transparency, as you mention. Anyone can find out the location of your computer, it seems, and that makes me unhappy. I suppose I'm still afraid of criticism (I think I showed that in responses to comments yesterday). I'm talking to people older and wiser about the roots of that one, because it's a problem. We have to be a little thicker-skinned than I am these days to be of any help to others. Love your bio, Elle. Even though I'm cowering and my hands are shaking, I'm commenting on your post — but I wouldn't dare to visit your HearWriteNow website. No more ... I'm running away before I get caught. Christopher, deadlines are my friend. I wouldn't get anything done without them! Though I am cautious about what of my personal information is online, I am more concerned about the dangers of my personal life. I'm afraid of meeting a bear on the trail or my boat stopping working while I'm on the way to or from work in the summer. Fearing someone not liking my writing may be a bummer of a thought but I don't fear it; you can't please everyone. Fearing what an editor will find? Na, that's an educational opportunity. Fearing someone will know where I live. Seriously. They'll still have to find the place, and with no roads out here, that's slim. I'm still afraid that whatever my last writing success was, it was just a fluke and I won't be able to do that again! Not silly, Heidi. It's exactly why the end result is good! Mood: The worst part is waiting for a response and then wondering why there is a delay. No email first thing in the morning - does that mean they loved it so much they are still sleeping in after reading all night, or does it mean they hated it and are struggling to word a tactful email? Larry: I'm about to take that plunge, too, and still wake up in a cold sweat wondering whether I should give the trad pubs one more go. Christopher: The deadline-free life for me, too. JK: I hear you. Criticism can be tough to bear even when it is delivered with plenty of tact and kindness. Linda: ;-) I wondered if anyone still read the bios. Consider yourself listed. I wouldn't worry too much about that black van parked outside your house - it will go away in a week or so, as long as you don't do anything threatening. Heidi: I know what you mean. I had a big dry spell because I was worried I would attempt to put pixels to screen only to find the screen remaining blank.